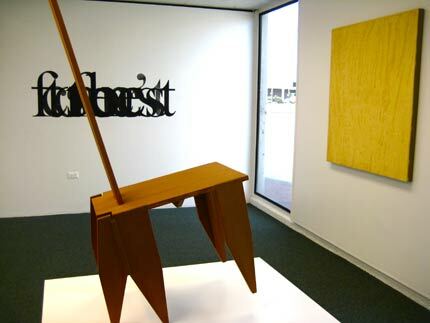 With a minimum of work, a William Wilde-designed firehouse in downtown Tucson was transformed into the Museum of Contemporary Art, giving the institution its first permanent home. 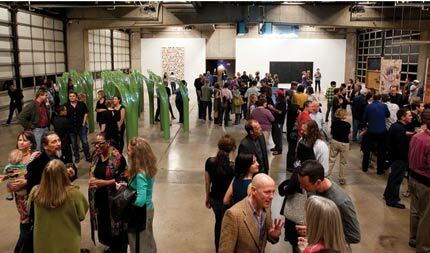 The Tucson Museum of Contemporary Art has been without a permanent location since its inception in 1999, putting on temporary exhibitions throughout the Arizona city. But the museum has finally found a home, or, rather, a firehouse, which opened Saturday. 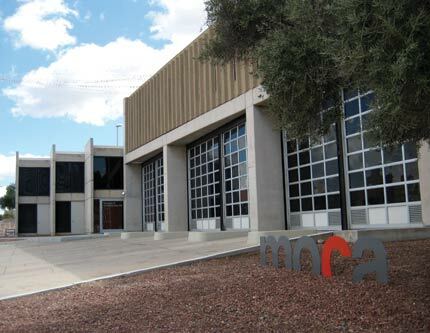 After scouting nearly 40 buildings, MOCA settled on William Wilde’s 1973 neo-brutalist Central Fire Station. 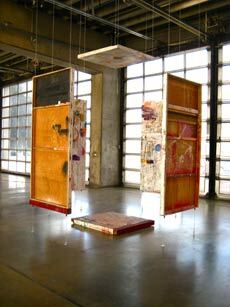 An installation inside the great hall at the new Tucson Moca. The building is a symphony of smooth poured-in-place concrete framing, a “wide wale corduroy” stair tower, and a crown of golden, rough, ribbed exposed-aggregate panels. In spite of the station’s evident machismo, firemen at the time of its construction found the orange interiors to be “sissy.” MOCA found them to be endearing—after they were turned into white box galleries, of course. A band of DIY artists created MOCA as a vehicle for the production and distribution of experimental work, appropriating empty downtown storefronts and warehouses as their venues. Since becoming MOCA’s director, Anne-Marie Russell’s mission has been to find an exceptional piece of architecture for MOCA to call home, no small task in a town whose main street is known as one of the ugliest in America. Wilde’s Fire Station is a significant work within Tucson’s network of neo-brutalist civic buildings. Unlike steel and glass desert modernism, its concrete shell is akin to the adobe brick and rammed earth indigenous to the region, exemplifying a desert ethic with its high thermal mass and passive solar orientation. But the brusqueness of Wilde’s design has won it few fans over the years. 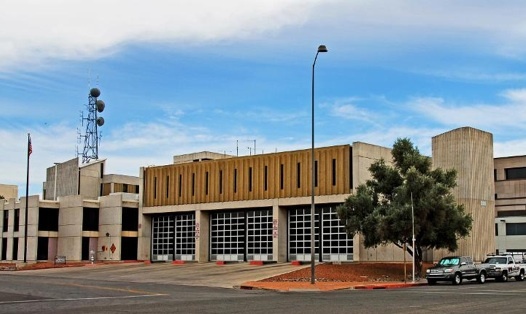 Before sealing the deal with MOCA, the Fire Department’s planned move to a larger facility put Wilde’s concrete fortress in jeopardy of demolition. Russell’s research convinced her, and ultimately the city, that the transformation from firehouse to art-house would be turn-key. Indeed it was; in six weeks, working round the clock from possession of the building to MOCA’s gala event in February, the dream became a reality. Architect Bill Mackey, one of MOCA’s artists-in-residence, facilitated the re-fitting of the building, and MOCA staff, friends, interns, and local crafts people carried out the job. The structure remains virtually unchanged—fire poles were required to be removed—and architectural work was minimal, both for aesthetic and financial reasons. “Roll out the fire trucks, roll in the art,” Russell said. The Great Hall, which is bound by 12 roll-up doors, during Saturday’s opening gala. The doors can be rolled up, drawing the museum into its surroundings. The administrative wing, stripped of cubicles and freshened up with white paint, now houses six intimate galleries and a video installation room. Above this lies the design wing – an interdisciplinary think tank and incubator for design professionals working in partnership with MOCA. Behind the medieval slit windows of the crowning floor are studios in which artists conceive and develop works. Twelve glazed roll-up garage doors surround the Great Hall—the 6000-square-foot column-free former ‘apparatus bay’—and can be opened onto the driveways that will become a 24/7 art and performance plaza. The Great Hall will remain un-conditioned, and during the summer will be programmed mornings and after dark to accommodate the harsh climate and requisite mid-day siesta. The firehouse prior to its renovations, which were minimal and mostly kept to the interior of the building. “Space and time are the most precious commodities for an artist,” Russell said. Thus, the museum will be as much about making art as presenting it, a full-service community facility not that dissimilar to the firehouse it replaced.